Data on household consumption provided by the European Comparison Project for 1999 are used to estimate the parameters of the cross-country Almost Ideal Demand System (AIDS) for two aggregates: food and non-food. The estimates are highly significant. AIDS specified with parameter estimates is used for assessing food demand in 2010. Four alternative price trends are considered, each assuming 2% real per capita income growth p.a. in Western Europe and 4% in 12 EU accession countries (ACs). 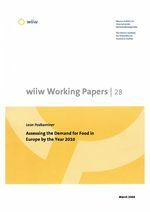 Food consumption will be rising 2.6% p.a. in ACs, and the ACs' share in all-Europe food consumption will increase from 13.6% (1999) to 16-17% (2010).